This week is Healthy and Safe Swimming Week. With public pools starting to open it is important to know how to keep yourself and others safe while swimming. Germs can survive for days in even well maintained pools! 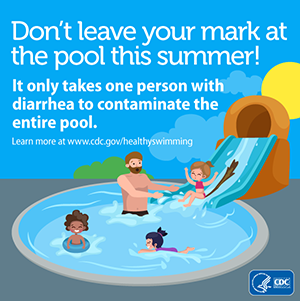 -Don’t swim or let children swim when sick with diarrhea. -Take kids on bathroom breaks every hour. -Shower before you get in the water. Rinsing off in the shower for just 1 minute helps get rid of any germs that might be on your body.